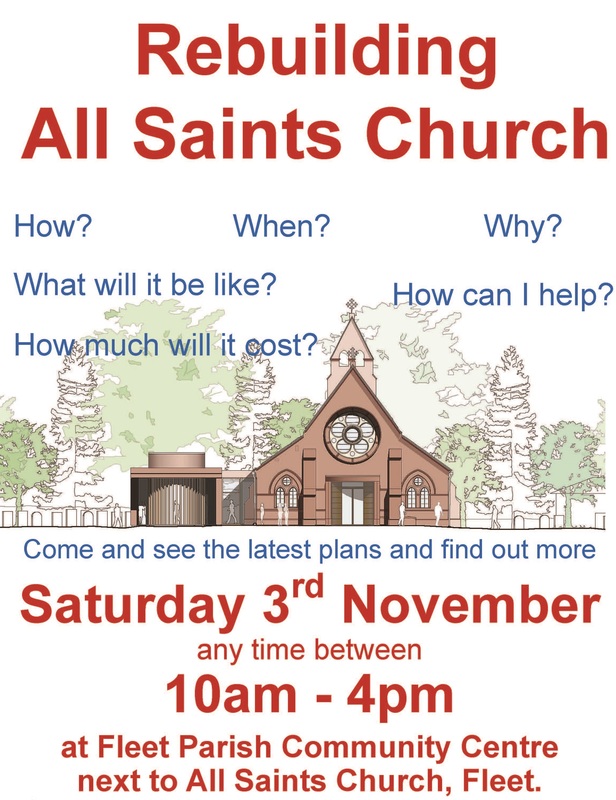 All welcome to drop in and see the latest version of the plans this coming Saturday, 3rd November, between 10am and 4pm. You will be able to speak with our architect and members of the rebuilding and fundraising teams. Come and learn more about the project and find out how you can get involved. Refreshments will be available to buy from our coffee bar all day and light lunches will also be on sale to raise money for the rebuild. The rebuilding Group and PCC are determined to rebuild All Saints as we believe God has inspired us to do – to the honour him and serve his people for generations to come. A preliminary planning response from Hart District Council is still awaited, but expected any day. We will be officially launching our fundraising campaign on 31st October & 1st November – the Feast of All Saints. Please be sure to be around on that weekend. We believe that unless we put as much effort into praying the project as we do into working for it, the project will not succeed. Therefore we are asking everyone to use the prayer below, daily, in their own prayers and with others. Therefore, we place this project into YOUR hands. May we build upon the foundations of your will and purpose for us. May we work together to achieve something lovely for you. May all obstacles be swept away on a tide of your grace. May the money, resources, good will and wise counsel, that we need to complete the task be released to us in abundance. All this we ask in the name of Jesus Christ – Craftsman, Saviour and Lord. Amen. We recently received a very positive response to our plans from the Diocesan Advisory Committee. We are awaiting a response from the Hart District Council planning department. A newly formed Fundraising group have exciting plans for a fundraising appeal to be launched very soon. Click on the video below to view the presentation of the latest plans as presented to the Annual Parochial Church Meeting on 19 April 2018 or click here to view the video full screen .This video has no sound. Please read the Questions and Answers on these plans here. Revd Mark Hayton has released the following Q&A – please read before viewing the video of the plans. QUESTION – Will All Saints Church be rebuilt? ANSWER – Yes it most certainly will, and it will be better than ever. QUESTION – Will it look like it did before? ANSWER – Yes it will. From Church Road it will look much as it always did. Inside, the structure of the church will be substantially as it always was. QUESTION – What will look different? ANSWER – On the north side (Behind the church, where the churchyard is) we hope to build a new lady chapel, vestry, meeting rooms, and other facilities, with a cloister and separate entrance in order to provide facilities for prayer, reflection, small meetings – even some larger gatherings, which will we hope honour God and serve our community. We also plan to improve access to the church by restoring the west end entrance and porch that were there when the church was first built. QUESTION – I see there are new plans on the website, what are these? 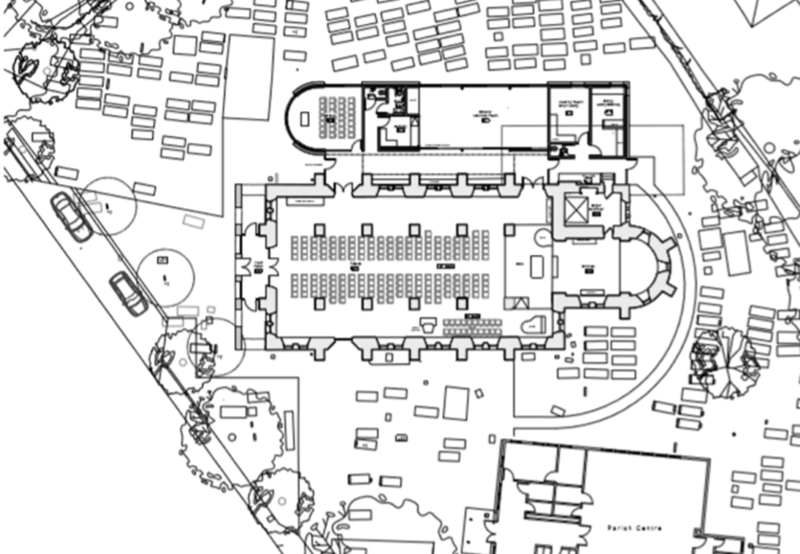 These are the latest set of plans drawn up by our architects following further consultation, discussion and the work of a small group on the final detail of what will be needed in our new church and annex. This will have a raised dais in front of chancel. Altar, Lectern and Pulpit will be together on a higher level. There will be room on either side for the choir. It is proposed to relocate the Organ in the old clergy vestry. This would allow for more space/natural light where organ used to be in the south east corner. New west end entrance! This will restore a feature that was on the original church built by Burges in 1863. It will provide a much better ‘wow factor’ as you enter, and provide much better access for brides and coffins. It will consist of a glassed entrance chamber, an open cloister at north and south ends, a landscaped exterior and new parking layby. A chapel to hold c 30 people – for midweek services, private prayer etc. 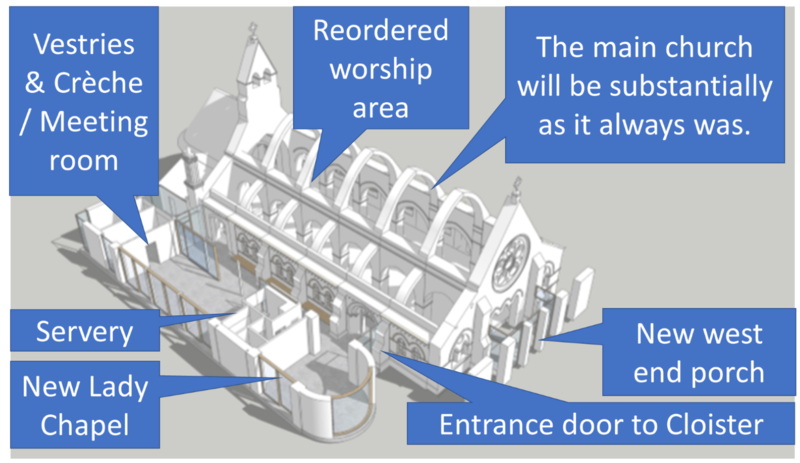 that will be accessible separately from the church and rest of the narthex, and placed at the West end, so as to be prominent, reflecting our priority of providing a place for people to sit to pray, remember, be quiet, read, reflect. A servery/Kitchen to serve visitors to the church and or annex without the need to come to FPCC this is NOT a Kitchen, but somewhere to serve drinks and snacks. A Creche/ Meeting room – A multipurpose room next to the servery. It will have sliding doors which would make it possible to open up into the corridor if needed. This room could be hired out to community groups and used by the church community for a whole variety of purposes! A movable central partition would allow this room to be used by Junior Church and creche on Sundays, and by community groups of varying sizes on other days. A Choir Vestry – for use by the choir on Sundays and for choir practice. This room could be used by others on the other 5 days of the week. It will be located close to the church east end. Clergy vestry / sacristy – for server and clergy – with private area for clergy. QUESTION – Are these the final plans? ANSWER – No. These plans have been drawn up by our architects for the purpose of submitting a pre planning application to Hart District Council and the Diocese of Guildford. This will hopefully tell us whether what we are planning stands a chance of being allowed by these planning authorities. Inevitably, changes to the plans will be proposed, which we will have to consider. Also, there will be changes we will need to make for practical or financial reasons as we draw closer to the FINAL plans and the start of rebuilding. ANSWER – The new All Saints will have all of these things. The old font was so badly damaged it will need to be replaced. The pulpit and monument can be repaired. Decisions will have to be made about when and how to repair these in a way that means the new church is fit for purpose for many years to come, rather than simply reproducing what was there before. QUESTION – How will the church and annex be heated? ANSWER – This has yet to be decided, though we have just received a heating report we commissioned earlier in the year. We are exploring the possibility of under floor heating supplemented by radiators. We are also looking into the possibility of ground source heating and solar power – we are a green church! QUESTION – How long will all this take? ANSWER – It will probably not be completed until the latter half of 2020. QUESTION – Why is it taking so long? ANSWER – From the beginning we were determined to bring something positive and good out of the tragedy that was the fire. We want the church to serve God and our community for many years to come and we want the new church to be the best it can be. None of us anticipated that it would take so long to clear, make safe, make plans, consult, appoint architects and other experts, produce a mountain of necessary paperwork and obtain the necessary permissions – all before a brick is placed! It took us over a year to clear, make safe, and secure the site. 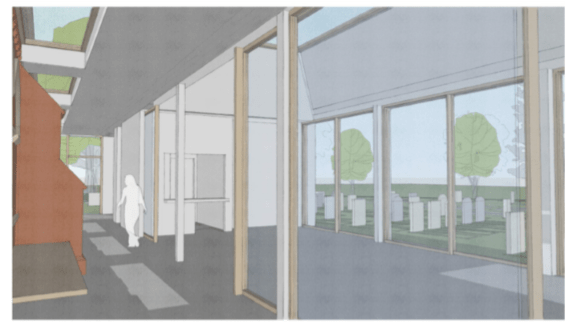 We spent six months consulting our community about what we needed the new church to provide, and another six months appointing architects and getting options drawn up. We then consulted the authorities about our plans. In September 2017 we reluctantly abandoned our original plan to change the internal structure of the church as it became clear that we were unlikely ever to get permission to do that to a grade 2* listed building of high architectural importance! Since then we have drawn up new plans, worked on the fine detail, started a fund-raising effort, commissioned a tree survey and a heating consultation. I think that’s quite good progress!. Others who have been through this experience tell us that actually we are moving quite quickly! QUESTION – What happens next? ANSWER – If the PCC approve the new latest plans at their meeting on 14th May, they will be submitted for preplanning application in May. QUESTION – How much will it cost? ANSWER – We don’t know for sure, this will depend on so much. It is likely to cost around £3,000,000. We anticipate around £2,500,000 coming from insurance, so may have to raise around £500,000 for improvements and extras. All this is without VAT! We have formed a fundraising group and are working with professional expert advisors on an appeal. We already have £75,000 donated by generous givers – without asking for it! Our Vicar Mark will be taking part in Fleet Fun Walk on Saturday 28th April 2018 to raise fu nds for the rebuilding of All Saints Church. The walk organised by Fleet Rotary is 8.2 miles around Fleet’s nature reserves and the Basingstoke Canal. If the button doesn’t work, click on this link or copy the link into your browser: http://mydonate.bt.com/donation/v4/donate.html?event=224137 Thank you for your support. If you’d like to join Mark on the Fun Walk see the details here. If you want to set up your own sponsorship page for All Saints Fund click here. The latest, and we hope final, plans for the rebuilding of All Saints will be unveiled at the Annual Parochial Church Meeting on 19th April at 7.30 pm in Ss Philip & James. Update Sunday 15 April: Following the meeting, the plans will be submitted for preliminary approval by the Diocesean Advisory Committee and Hart District Council. These are the main authorities responsible for approving any plans, but they will consult others including conservation bodies. Meanwhile, a heating feasibility study is being done to determine the best system for the new building. This will include an exploration of solar and ground source heating. All members of our church family are welcome to attend. Please pray for our Architects, David Spragg and David Finlay as they prepare the latest set of plans for approval. More details of the Annual Parochial Church Meeting together with the Parish Annual Report and Annual Accounts, can be found on the Parish website. The Annual Report will have a summary of the progress on rebuilding. The Accounts of The Parochial Church Council of the Ecclesiastical Parish of All Saints Fleet, (Charity No. 1129190) includes the All Saints Fund.